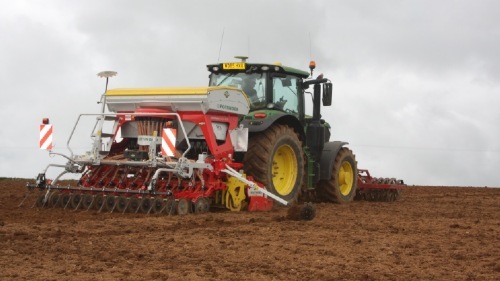 High cost effectiveness, versatility and convenience – these are the key advantages of the new DUPLEX SEED drilling process, available on Pöttinger AEROSEM PCS seed drill models. With DUPLEX SEED, silage and corn maize is planted in double rows. In addition to increasing yield by up to 10 percent, it also increases output during drilling thanks to the higher driving speed. As a result, DUPLEX SEED is a real economical alternative to conventional precision seed drilling. The maize can be planted flexibly with a companion crop or with direct fertilisation. The double row is also suitable for corn maize harvesting. AEROSEM PCS DUPLEX SEED offers the highest level of convenience with one seed drill for cereals and maize thanks to its ability to change quickly between seed types. Further key advantages include direct control of the seed flow as well as monitoring of each maize row. In 2015, the University for Soil Sciences in Vienna tested the PÖTTINGER AEROSEM PCS DUPLEX SEED and confirmed its efficiency: the increase in yield recorded with silage maize and corn maize was up to 5.5 percent. In 2016, large scale tests were performed in Hungary, Austria and up to North Rhine-Westphalia (GER) and the Elsace (FRA). The results provided unequivocal proof: with DUPLEX SEED a significant increase in yield was achieved at all locations. 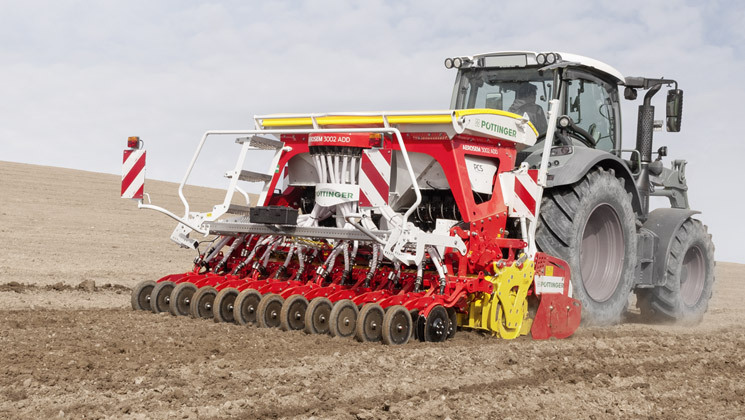 In addition, it delivers an increase in performance of around +25 percent during planting thanks to the higher driving speed of up to 10 kph with an increased hectare output of almost 2 hectares per hour with 4 double rows (working width 3.0 metres). All the while with the highest level of precision because the seed metering system is running at half the normal speed. Double-row drilling with the AEROSEM also provides better erosion protection because it does not leave behind additional wheel marks. The Pöttinger AEROSEM is a true all-rounder for corn maize, silage maize, grass companion crop and fertiliser. 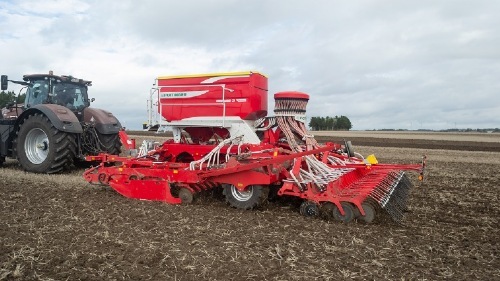 The AEROSEM ADD with DUPLEX SEED features double rows of offset plants with a spacing of 12.5 cm. The row spacing between each set of double rows is 75 cm, so they are easy to harvest using a standard maize header. Convert between drilling cereals and planting maize in no time: simply fold over the partition and fit the firming rollers and slot formers. 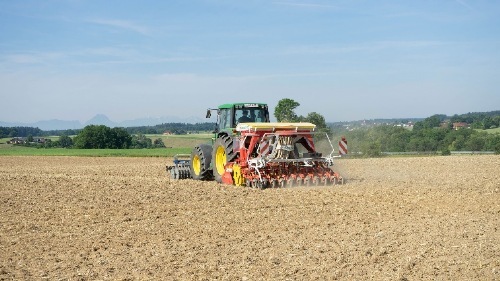 Change the number of seeds per square metre directly at the operator terminal: just tap in the number of seeds per hectare or seeds per square metre. No need to touch the drive chain. Each row of maize is reliably monitored directly at the coulter and centrally using the level indicator at both ends of the maize hopper. In terms of plant cultivation, the effects of double row planting are extremely positive. Planting maize in a double row creates the perfect distribution density conditions: more light, more water and more nutrients. Because there is 30 percent more space between the seeds and therefore 70 percent more space available for each plant, the roots can spread out in the soil much more easily. The individual maize plants then display less competitive growth behaviour. The roots spread into the free areas. Using a side strip of fertiliser actively encourages the roots to grow outwards. Moreover, the whole maize crop can absorb more sunlight because the plants do not shade each other as much as in a conventional formation. Increased photosynthesis is the result. Thanks to the wider spacing, the maturing phase is optimised with potential for less dampness - especially with corn maize. Compared to single rows, there is also less erosion risk thanks to improved plant distribution density. Ground shade is also improved with double rows, reducing water losses, suppressing late weeds and promoting rapid row integration. Field tests have shown 10 percent better shade up until the end of young plant development (EC 19).